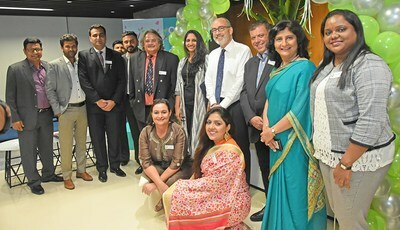 MUMBAI, India, July 3, 2018 /PRNewswire/ -- HH Global, the world's fastest-growing and most innovative marketing execution partner, held a ribbon-cutting ceremony for the official opening of the Mumbai office in the presence of the UK Deputy High Commissioner (West India), Crispin Simon, celebrating a milestone of business growth and success in the Indian market. Located at Lotus Corporate Park, the new office encompasses a work space of 13,500 sq. feet. The heart of the office is its large kitchen - a space of collaboration and innovation. Other features include creative spaces, and expanded departments and facilities to serve HH Global's growing operations in marketing and creative production services. The new location is staffed by a highly skilled team dedicated to showcasing HH Global's innovative and cost-effective solutions to stakeholders, as well as to incorporating global trends into existing projects and future partnerships. During the event, a considerable number of renowned leaders and business partners highlighted the significant progress and quality of services HH Global has successfully implemented in the APAC region, calling attention to HH Global's ability to cater to the critical needs of global companies located in India. "We are thrilled to see that our considerable, rich heritage in marketing execution has benefited clients across different industry sectors in the region," stated APAC CEO, Andrew Price. "This long-standing practice fostered our commitment to invest in infrastructure and expand operations in several markets." The day was a great success and an opportunity to celebrate HH Global's amazing growth and development.